These two free printable birthday cards give you some examples of how greetings can be added. This image is not suitable for printing, for that, you need to click on one of the "Card" links below the small picture. That will link you to a high resolution file that you can download. I had fun painting this sugary birthday cake, thinking all the while, it's calorie free! Its playful image is appropriate for all ages and with just one candle, perfect for first birthday celebrations. The enhancements that I add are a sparkle to the lit candle and a few plump dots in the flowers atop the cake. 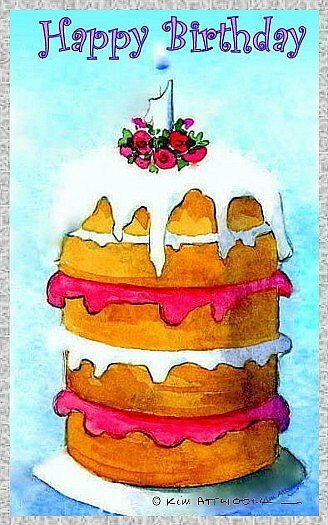 Delight celebrants of every age with this cake card. 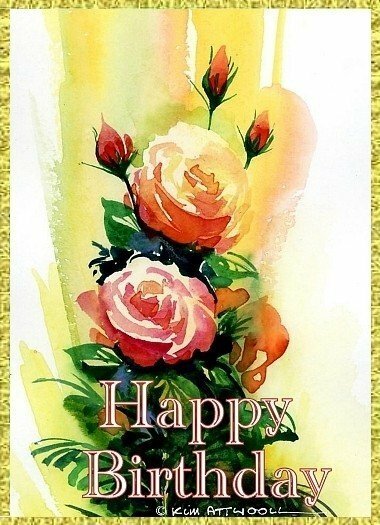 You can make any card into a birthday card just by adding a greeting. You don't need a state of the art graphics program to do this. Picasa, a great free program from Google, is all you need and you can click on one of these links for a free download. Picasa can do many things and has a great help menu, but you can click here to get a quick start and simple instructions for adding text to your cards. You can also get there by clicking the "Making It Unique" button on the left where you will find other great ideas for customizing your cards. These lovely blooms and buds were painted after a soft wash background had dried. The darker lower portion of the painting lends itself to the placement of a light colored greeting. Remember to take advantage of the contrast when you are designing your own cards from graphics, paintings or photos.